Late-night talk shows are cults of personality, and putting those personalities front and center is an essential part of promoting them online. Nobody could benefit more from being showcased and humanized right now than Stephen Colbert. Critics and fans are losing patience waiting for the show to find its voice, and after nine months, the headline-dominating question “Who’s the real Stephen Colbert?” still isn’t fully answered. Building a dedicated following should’ve been easy. After all, The Late Show inherited a fan base eager to get engaged. For nine years, The Colbert Report viewers gamely ran with every idea Colbert’s right-wing pundit character threw at them, most notably donating more than $1 million to his super PAC. That spirit of collaboration should be at the heart of The Late Show’s approach to social media. Instead, it keeps viewers at arm’s length, a significant misstep in an era when audiences expect to have their voices heard. The Late Show With Stephen Colbert is struggling on social media, but what critics cite as its biggest problem—a lack of viral videos on par with Jimmy Fallon’s Lip Sync Battles or James Corden’s Carpool Karaoke—isn’t what needs fixing. The Late Show need only compete with itself to grow its online fan base. It can do that without massive YouTube wins but not without addressing its underlying flaws: subpar exclusive content, an absentee host, and a failure to connect with fans. Everything we’ve seen of Colbert’s online presence suggests that the show launched without an informed social media plan. The Late Show’s senior staff all came over from The Colbert Report, where Comedy Central handled most of the online media. Producers may not have realized how much strategizing was necessary. In January, the show finally began live tweeting each episode. It’s considered a best practice in television because it creates a sense of community among real-time viewers, and makes non-viewers feel like they’re missing something incredible. Corden’s Late Late Show does a particularly great job of this, concisely celebrating episode highlights and mixing in retweets of fan reactions. The Late Show, on the other hand, often sends out cryptic half jokes that make sense only to those watching live, and rarely gives any love to the smattering of fans who tweet along. There’s little evidence that the account is even being run during the broadcast; most nights it seems the tweets were loaded into a scheduling program. The show assigned its Twitter fans an arbitrary nickname, “#Lateys” (Fallon has his #FalPals, after all), which seems more patronizing than endearing when it’s a one-way conversation. If the show won’t directly connect with viewers, it should at least offer up better social media content: online exclusives that excite fans and make them feel invested in the show’s creation. A proven tactic is to take audiences behind the scenes. A standout is Conan O’Brien’s Scraps, a collection of rehearsal videos from an empty studio. Fallon chose the immediacy of the live-streaming app Periscope, and started broadcasting his monologue rehearsals online in 2014. The Late Show takes the opposite approach. Its online exclusives are dominated by nicely shot, fully scripted bits starring guests from previous nights. Colbert himself is nowhere to be seen in these, and not surprisingly, few of the pieces get much traction. Despite low views, the show kept churning them out through the winter, wisely pulling back on the quantity only recently. On Instagram, those polished videos are making way for posed dressing room snapshots, but for every pic of Colbert with his arm around a guest, there’s another of the office coffeemaker or a toothbrush on the bathroom floor. The Instagram password would be more useful in the hands of Colbert’s house band, Jon Batiste and Stay Human. Saxophonist Eddie Barbash hands out “likes” to fan contributions that the official account ignores, and he and other band members capture those fun, up-close rehearsal surprises the show should strive for, like Jon Stewart killing it on the drums (who knew?) or Colbert practicing his double Dutch skills. Colbert himself could pick up some of the slack, but his 11 million Twitter followers don’t hear as much from him as they used to. In the Colbert Report era, he and his staff picked one unused joke per day to tweet out. The habit didn’t survive the leap to the new show, and his feed is quiet for days between personal shout-outs and Late Show clips. Elsewhere online, he’s a tease. He quietly started a personal Instagram account a year and a half ago, and abandoned it after two posts. He’s a longtime Reddit visitor, but commented just once on an August post about his new theater marquee. He hasn’t even participated in a Reddit AMA, the site’s popular Q&A feature with a star-studded history. It’s not that The Late Show isn’t capable of being real. Up until September’s premiere, the show was on the right track with Colbert-centric YouTube sketches and Instagram posts, and candid conversations via the Late Show Podcast. Colbert chatted with staff members about their personal histories, comedy bits that didn’t make the cut, and how anxious they were to hit the air. Whether intentional or not, the show endeared itself to viewers before it even premiered. That podcast stopped in August, but new episodes started appearing in April in the form of parody Game Of Thrones recaps. What was once an effective method of bringing its audience into the fold is now a dumping ground for minute-long bits of unremarkable comedy (which, again, don’t star Colbert). Newly installed showrunner Chris Licht might draw on his experience leading CBS This Morning to make improvements, but the most important lesson The Late Show needs to learn can be taken straight from The Colbert Report: A show is better when you do it with your viewers, rather than at them. Make the audience feel like participants. They’ll respond by tuning in more often and advocating for the show on its behalf. With underwhelming ratings, Colbert needs that boost of viewer loyalty, and he needed it yesterday. 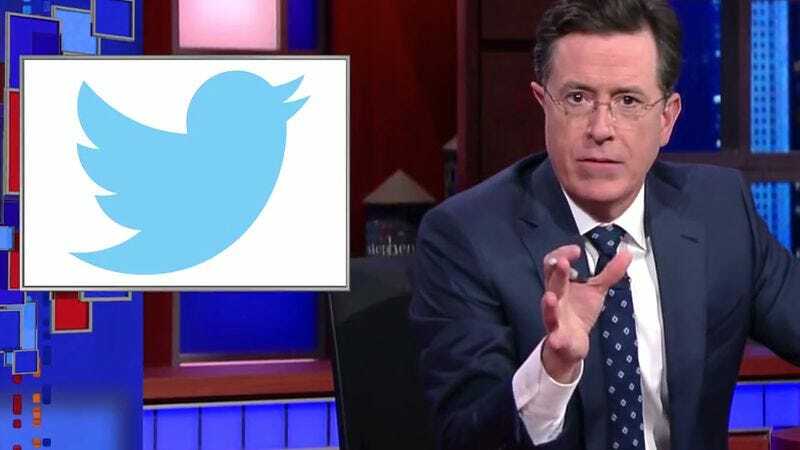 If the show can let its guard down to create an authentic relationship with its followers, and convince Colbert himself to get more active, it can make significant gains on social media without becoming a viral video factory.